In this paper we prove the boundedness of certain convolution operatorin a weighted Lebesgue space with kernel satisfying the generalizedH¨ ormander’s condition. The sufficient conditions for the pair of generalweights ensuring the validity of two-weight inequalities of a strong typeand of a weak type for convolution operator with kernel satisfying thegeneralized H¨ormander’s condition are found. Weighted Lebesgue space, Singular integral, Kernel, Generalized H¨ormander’s condition, Boundedness. Bandaliev, R. A. Two-weight inequalities for convolution operators in Lebesgue spaces, Mat.Zametki, 80 (1), 3–10, 2006 (in Russian). English translation: in Math. Notes 80 (1), 3–10, 2006. Bandaliev, R. A. and Omarova, K. K. Two-weight norm inequalities for certain singular integrals, Taiwanese Jour. of Math., N2, 713–732, 2012. Calder` on, A. P. and Zygmund, A. On the existence of certain singular integrals, Acta Math., 88, 85–139, 1952. Calder` on, A. P. and Zygmund, A. On singular integrals, American Math.J., 78 (2), 289–309, 19 Davis, K. and Chang, Y. Lectures on Bochner-Riesz means, London Math. Soc., Lecture Notes ser. 114, Cambridge Univ. Press., 1987. Garsia-Cuerva, J. and Rubio de Francia, J. L. Weighted norm inequalities and related topics, North-Holland Math.Studies, 1985. Grubb, D. J. and Moore, C. N. A variant of H¨ ormander’s condition for singular integrals, Colloq. Math., 73 (2), 165–172, 1997. Guliyev, V. S. Two-weight inequalities for singular integrals satisfying a variant of H¨ ormander condition, Journal of Function Spaces and Appl., 7 (1), 43–54, 2009. H¨ ormander, L. Estimates for translation invariant operators in L p spaces, Acta Math., 104, 93–140, 1960. Kabaila, V. P. On the embedding L p (µ) into L q (ν). (in Russian) Litovsky Mat.Sb., 21, 143–148, 1981. Kokilashvili, V. and Meskhi, A. Two-weight inequalities for singular integrals defined on homogeneous groups, Proc. A.Razmadze Math.Inst., 112, 57–90, 1997. Maz’ya, V. G. Sobolev spaces, Springer-Verlag, Berlin, 1985. Stein, E. M. Note on singular integral, Proc. Amer. Math. Soc., 8(2), 250–254, 1957. ISNAD B, R. A. , -, - . "On One Weighted Inequalities for Convolution Type Operator". 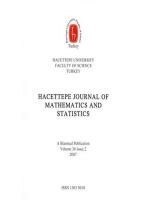 Hacettepe Journal of Mathematics and Statistics 42 / 3 (March 2013): 199-210.